Day Night wordpress template is a beautiful dual wordpress theme where every visitor can switch it between “night” and “day” with a click of a single button which is located on top of the sidebar. When in day mode the headergraphic shows a beautiful nature scenery with low cut green grass and a single big tree in he middle. 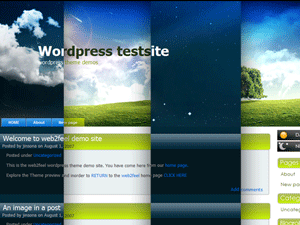 While in day mode the theme is bright, white, green and blue. Beautiful skies are visible in the background. When switched to night mode the theme is dark blue, black and a touch of white clouds in the header graphic. Pages menu which is just below the header is bright blue – but that’s the only bright color when in night mode. Overall this is a 2 column wordpress theme designed by web2feel.com. This wordpress skin also supports widgets (just make sure you enable the widget function in your blog’s admin area – under Appearance).